Oak Park is the very first suburb directly west of Chicago as you are heading out 290 the Eisenhower expressway. Oak Park residents take great pride in their diverse population and small town feel. 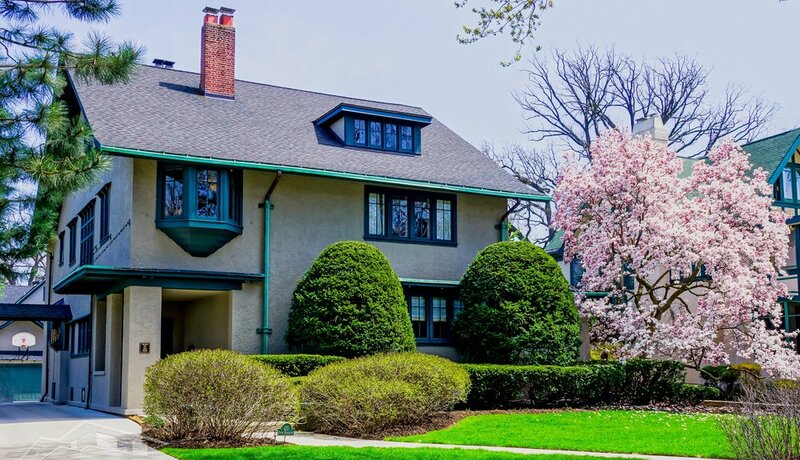 Oak Park is the closest suburb to Chicago where you can find condos starting in the $100k range to starter single family homes in the mid $250k to grand estate homes reaching more than $3.7 million. When talking real estate I like to think of the village as being divided into 4 corners. The horizontal divider is Lake Street with Ridgeland Ave cutting down the middle to create the four sections. The village center is not really located in the crosshairs but more to the west around Lake Street and Oak Park Ave.
Is a very desirable location with its quiet streets and larger lot sizes. Homes here can normally range from the mid $350k (for something that needs work or is small) to the mid and upper $1mil level. There is the Frank Lloyd Wright historic district in the NW corner that holds the estate homes I mentioned above. These particular homes are in their own price category going up to and past the $3 million mark. Some styles of homes in the NW corner will be Victorian brick and frame homes, brick and frame center and side entrance Colonial, brick and frame Tudor, and traditional stucco 4-square and 3 bedroom homes. As with all the corner sections of the village, the closer you get to the center of the village the older the homes. This section is also home to one of our most beautiful parks, Lindberg Park. Contains some magnificent Victorians and the farther you get from the center of town you will see a good number of large brick Chicago bungalows and many California or Craftsman frame bungalows. Homes here will range from the low $250k to the mid $975k range. The NE corner has its share of large lots similar to the NW corner yet travel out from the center and you will see the houses get a little closer together. Of Oak Park is home to our Harrison Street art district. The whole entire corner is a very popular place to live for small new families. There are rumors that there are some blocks south of Madison street that can have as many as 40+ children between the ages of newborn and 9 yrs old. Now that is one heck of a block party!!! This community is grounded by two of our greatest Catholic parishes (Ascension and St. Catherine/St. Lucy's) yet many denominations and beliefs are spread throughout our entire village. Homes here can range from mid $200k to $1.5 million closer to the Lake Street divider. More Craftsman bungalows, Victorians, and Prairies will be had here. Is an older part of the village with large Victorians and Prairie style homes expanding south away from the village center. This corner also contains a large portion of our rental property mainly in the form of vintage apartments and condos. It is in this area that Oak Park has a very large population of young single professionals. Single-family homes in this area can be 4 bedrooms starting in the low $350k. Three bedrooms can be had for the low $300k and closer to the Lake Street divider you will find some pretty amazing Victorians that are catching over a million dollars when they come on the market.